Have you ever felt judged at the gym because of your body, clothes, hair, the way you express your gender, or the types of fitness activities you like to do? Have you ever felt unsafe using a bathroom or locker room, or like you weren’t welcome on a sports team? You’re not alone! 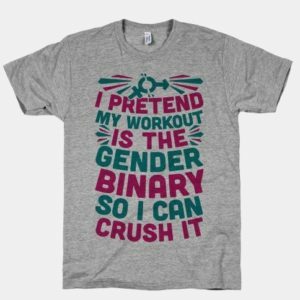 So much of our world is gendered, including where we workout. 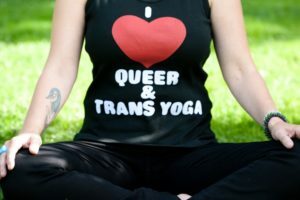 With bathroom bills and rising stigma against LGBTQ people – especially transgender and gender nonconforming people – it can be hard for us to find places to exercise where we feel seen and supported. On top of that, we have higher rates of tobacco and alcohol-use, experience harassment and discrimination, and other mental and physical health challenges that prevent us from living our longest, most fabulous lives. It can feel like we live in a society that doesn’t support the health and wellness of our community. Lez Run was also featured on the Philly Mayor’s Cup, where you can find more great running clubs! Hot off the press! Lez Run, William Way LGBT Community Center, Out Philadelphia Athletic League, and Pride are all teaming up for a 1.5-mile Pride Run to kick-off the parade this year. See the PGN Press Release for more details. Something else we love about Studio 34? In order to make yoga accessible for everyone, they offer a Work Exchange Program where you can trade a couple of volunteer hours at the front desk for free classes! 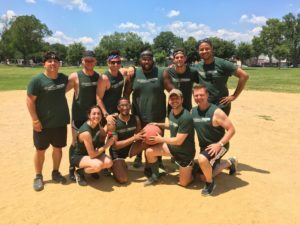 Stonewall Sports offers Kickball, Billiards, Dodgeball, Sand Volleyball, and Indoor Volleyball. Check out their website for registration info and pricing! What’s your favorite way to move? 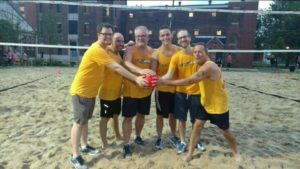 How do YOU queer fitness? 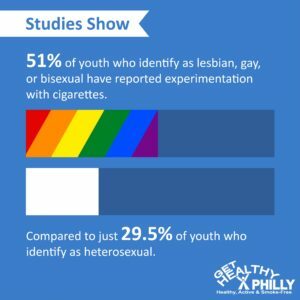 Tell us your favorite LGBTQ+ positive exercise spots by using the hashtag #mymovesmyway when you post about your favorite ways to stay active or email elissa.martel@phila.gov if you have a story about queering fitness that you’d like to share! 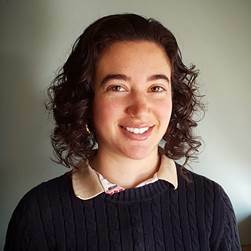 Elissa Martel is the Special Projects Coordinator at Get Healthy Philly. Last summer, she discovered that Aqua Zumba is her favorite way to exercise. Pop music, zumba, and an outdoor pool – what more could you ask for? Free Aqua Zumba will be back this summer, so stay tuned!